Eco Reps are a group of students committed to creating a culture of environmental stewardship on campus at Cal Poly. Managed by the Green Campus Team within Facilities, Eco-Reps exemplify the "learn by doing" motto and play a direct role in Cal Poly's advancement to a fully sustainable future. Becoming an Eco-Rep will equip you with knowledge and skills to tackle environmental issues through tangible action and outreach. Join Eco Reps to grow into a sustainable leader on campus, meet new people, and build professional skills. We are always looking for new students, if you are interested, please email greencampus@calpoly.edu. 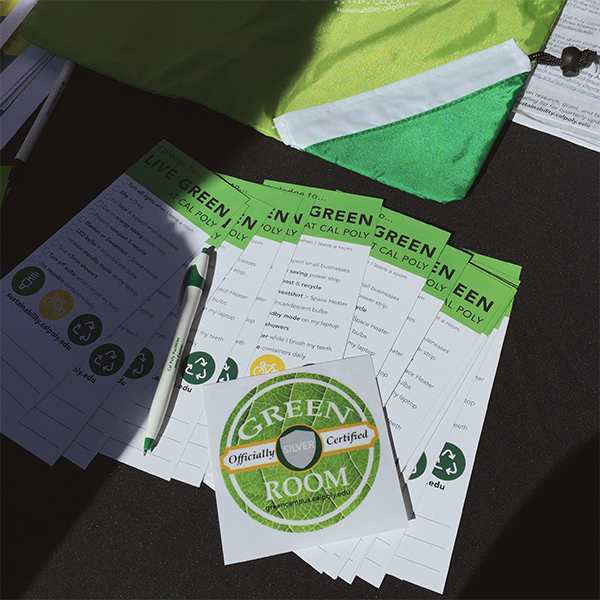 Through the Green Room and Green Office programs, Eco Reps provide sustainable consultations to on-campus residents staff, and faculty to educate and empower the Cal Poly community to live more consciously, in turn reducing Cal Polys energy, water, and waste. The goal of the Green Room Certifications is threefold: to serve as a mechanism to continue increasing sustainability awareness, to bring together already sustainable minded students, and to bring new students into the community. To certify your apartment, office, or building please email greencampus@calpoly.edu.